FQB "Generations" Collection will exceed your expectations in your search for a digital scrapbooking genealogy or ancestry kit. We all know how important family is and to capture the details of our ancestry for future generations. This digital kit will serve you well to not only preserve your family's lineage but also to create a beautiful keepsake album. 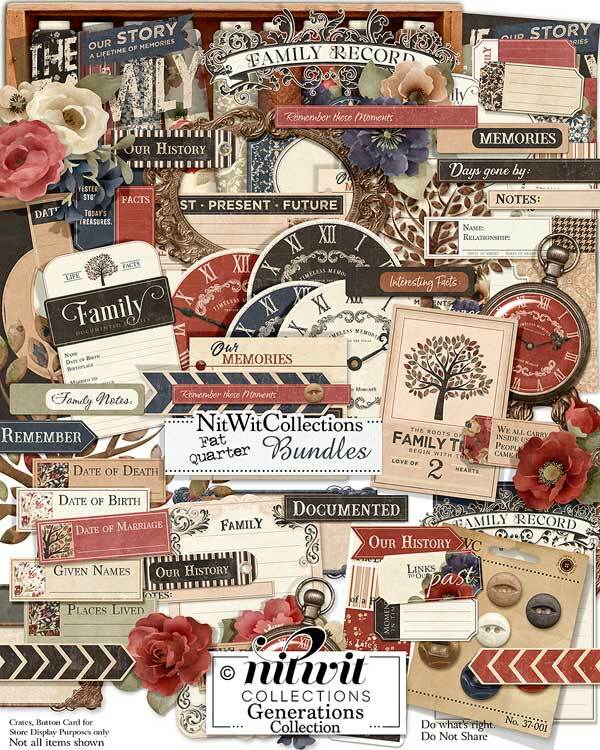 The elegant and mature theme of this kit marry well with all of the labels, fact cards and more that let you wander through memory lane in style. Ensure that your family memories and details can be remembered by all future generations.....a true gift. 5 Clocks....some with hands and some without - "Timeless Memories Through the Years"
1 Cluster - "Our Memories, Documented"
5 Fact labels to diarize these important details with class - "Date of Birth", "Date of Marriage", "Date of Death", "Given Names", "Places Lived"
3 Metal labels with blank centres for you to journal in or use for names, places, etc. 1 Sentiment digital stamp - "The Family...."
2 Family Tree elements in two different colours.....how do you see using these?? 1 Vintage word strip - "Documented"